Ethereum is being affected by what is popularly known as the “difficulty bomb” embedded in the code – and this month’s upcoming hard fork is expected to once again push its effects further into the future. The piece of code was originally created in an effort to create an incentive – a negative one at that – for miners and developers to manage the transition from proof-of-work consensus to proof-of-stake. In effect, the difficulty bomb as referenced back in 2015 by former ethereum CCO Stephan Tual raises the difficulty level of mining a block on the ethereum blockchain exponentially over time. The bomb began to “go off” so to speak last December after being delayed once in June 2017 and again in October 2017. The initial impacts of the code – though minor to start off with – are slowly but surely starting to become noticeable on the network, as the data shows. 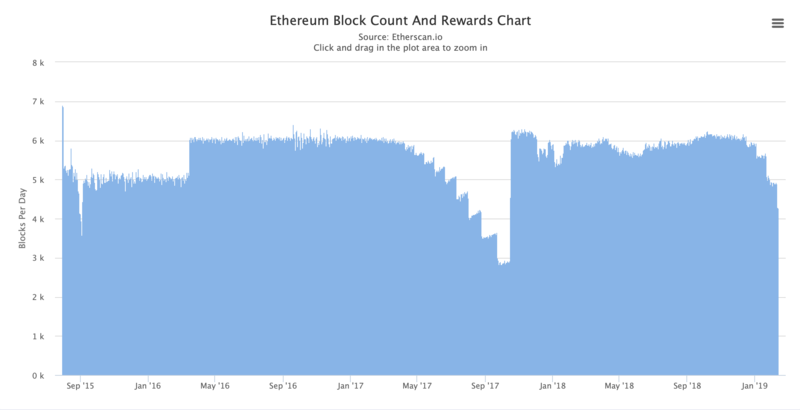 As reported by blockchain analytics site Etherscan, the ethereum blockchain saw its lowest level of daily block reward issuance Monday with a recorded 13,131 ETH. By comparison, as late as mid-November, new issuance was regularly seen above 20,000 ETH. What’s more, Etherscan reports a clear decline since December in the number of blocks produced on ethereum per day, which sits at present below 4,500 blocks. Afri Schoedon – release manager for ethereum client Parity – estimates if left unaddressed, it would take two to three months from now for the difficulty bomb to stall the ethereum blockchain to new record-lows. Yet before that happens, the bomb is actually expected to be delayed again for a period of 12 months as part of a system-wide upgrade known as Constantinople. Constantinople – which is scheduled to launch later this month at block number 7,280,000 – will, among other changes to the network, stabilize average block count to 5,700 blocks daily and reduce block time creation to roughly 15 seconds, according to Schoedon. And this not being the first time ethereum core developers have had to include such tweaks to the difficulty bomb code. Schoedon expressed exasperation at the need to deal with the reoccurring effects of the bomb at all. “The bomb is an annoyance that no longer serves a purpose,” Schoedon told CoinDesk. Schoedan elaborated on that point by highlighting that the transition to PoS – also commonly dubbed ethereum 2.0 or Serenity – likely won’t occur within this year or next. To this point, Eric Conner – founder of ,ethereum information site ETHHub – agreed telling CoinDesk that, in his view, the motivationary effect of the difficulty bomb isn’t the same as it was. Some developers, on the other hand, continue to see the difficulty bomb as playing an important role in the network’s evolution. As with the previous delay to the difficulty bomb included in system-wide upgrade Byzantium, users faced record low block counts in the fall of 2017. Mining difficulty levels increase by a factor of two as a result of the bomb every 100,000 blocks, Connor noted. As a result of this, he also highlighted that during the months shortly preceding Byzantium in October 2017 average block times on the ethereum network reached record highs of up to 30 seconds. This time around, Connor doesn’t imagine any further impacts of the difficulty bomb on the ethereum network, given that Constantinople – with its kicking-of-the-can built-in – will occur before the next expected uptick in mining difficulty at block 7,300,000. What’s more, after Constantinople is activated, ethereum will face an added reduction of block reward issuance from 3 to 2 ETH. The reduction “thirdening” was put in place in order to mitigate the impacts of inflation on the network without a timed difficulty bomb. 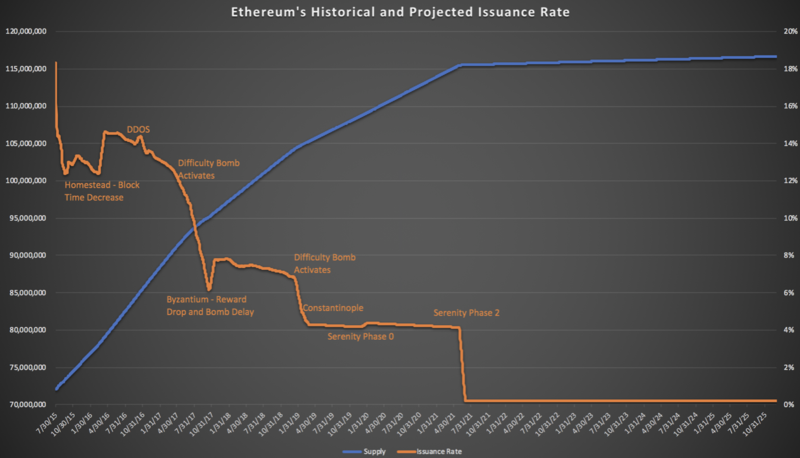 The following graph on ETHHub illustrates a continued downward trend for ETH issuance in the years ahead. Of course, the projected trend for issuance illustrated above in orange is highly dependent on both activation of Constantinople and Serenity over the next two to three years. A testnet launch for the initial phases of Serenity is expected sometime in March. Nevertheless, as with most things in cryptocurrency development, only time will have the final word.